Rent Brownstone Gardens | Corporate Events | Wedding Locations, Event Spaces and Party Venues. Brownstone Gardens completely shields you and your guest from the outside world by a profusion of mulberry and sycamore trees, variegated shrubbery, lilies and a fragrant, multicolored rose garden. Beautiful pathways lead you around our grounds allowing the full beauty be visible to your guest. Welcome breezes rustle the foliage overhead as your guest stroll down a shaded path towards the Koi Garden. Here guests can enjoy seating in the gazebo, watching the Koi fish in the pond, listening to waterfalls or seating in the old-fashioned wood swing. In the evening guest will enjoy the beautiful tent style lights. Like snapshots from a royal palace our Grand Court will take your breath away. A stone aisle way surrounded by lush green lawn leads you down to an exquisite stone sanctuary. Adding romance and beauty to this area are Crepe Myrtle trees and rose covered trellises. The design of the garden and temple stand true to tradition while the foliage provides sweet intimacy of natures embrace. Your guests will truly feel that they've entered into paradise when they step into our Bridal Falls area. Our 12 foot waterfall with Angel's Trumpet Vines spreading their wings across. The dance floor is sunken below the guests tables so no one will miss a thing. The twinkling lights above you and your guest add the extra hint of romance. 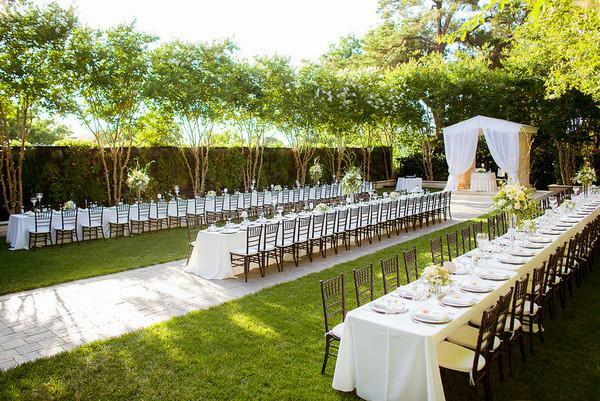 This is the perfect venue for any dreamy occasion.